My home office looks like a filing cabinet (or two) threw up in it. I have books, papers, notes, and knickknacks scattered everywhere. While I sort of know where everything is, it is not as organized as it could be for maximum efficiency. Not by a long shot! The same can be said for a lot of people’s finances as well. How many of us have little scraps of paper receipts that we have to dig through during tax season to help us file our deductions? Do you carry a huge purse with everything you would ever need in it? Did you know that that could be a reason why your finances are in disarray? Or, worse yet, how many people are scared to invest for retirement or save for a rainy day because they feel overwhelmed by the sheer choices and the potential complexity of it all? Boy do I have a book for you this week! Now there is hope for all of us. 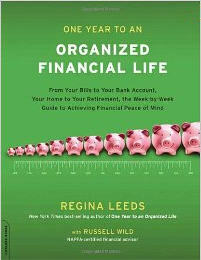 Regina Leeds has a book out called, “One Year To An Organized Financial Life“. It is a great read, and I would highly recommend it to anyone looking to organize their lives and their finances. The book would be especially helpful and is geared towards people who are just starting out managing their personal finances. But, there are some wonderful tips in the book that can benefit investors and money mavens of every level of sophistication and skill. Other topics covered throughout the months and the book include: accessing your finances, spending less and saving more, getting ready for taxes, borrowing smartly, long range planning, children and money, and many other great money topics. It is a week by week guide to finding the financial piece of mind that you deserve. “One Year To An Organized Financial Life” has it all. The author uses a Zen philosophy to bring clarity, simplicity, and order to your personal finances. The book builds on a slow and methodical way to bring your finances under control and lays out certain tasks or goals that you have to accomplish each week. Some of the tasks that I found very helpful were cleaning out my wallet of unneeded receipts and business cards, setting up a financial filing system, and streamlining my home office. There are tips and tricks that are recommended in this book that you normally would not think of or you wouldn’t even think that they have much to do with personal finance. Leeds starts the reader out by examining his or her entire situation and not just the financial one. Are you drinking too much coffee or soda? Are all your dollar bills in your wallet facing the same direction and in denominational order? I know what you are thinking….no! And, so what? It matters! “One Year To An Organized Life” is a great book full of practical money and life advice for everyone. You should definitely check it out and add it to your reading list. Side Note: Regina Leeds also wrote “One Year To An Organized Life” and “One Year To An Organized Work Life“. That’s just a great post ! I saw similar several days ago on Twitter. Thank you for this beautiful review!